The bill was put forward by Deputy Clare Daly, following a bill that was rejected in April. AN ABORTION BILL put forward by Deputy Clare Daly has been voted down by 101 votes to 27 in the Dáil this evening. Today saw the second evening of debate on the Medical Treatment (Termination of Pregnancy in Case of Risk to Life of Pregnant Woman) Bill. Yesterday, a number of TDs used the debate as an opportunity to hit out at the leak of the Expert Group report on abortion at the weekend. The bill was for legislating for the X Case, and the full details of the bill can be accessed by clicking here. It would have provided an interim legislative arrangement as required by the Council of Europe, for termination of pregnancy where as a matter of probability a real and substantial risk to the life of the pregnant woman exists. It also would have made provision for the prevention of any curtailment, hindrance or preclusion of such treatment that may arise as a result of the pregnancy of the woman. This evening, United Left Alliance Deputy Daly said it was “scurrilous” that the Dáil was back voting on such a bill, and said she was disappointed by the reaction of the Government on the issue. She said that she took offence at claims from Fine Gael and Labour that those for the bill were being divisive, and said that Irish people have moved on on the issue of abortion. Deputy Daly also said that descriptions of “walk in, walk out” abortions were “an insult to women and doctors”. She received a round of applause after she concluded her closing speech before the TDs voted on the issue. We take this position because we recognise the urgency of legislating to give legal protection and clarity to pregnant women and their doctors. We take this position because the inertia and negligence of successive governments on this issue – a basic issue of protecting pregnant women’s lives – must be ended. Minister of State for Primary care in the Department of Health Alex White said that Irish abortion laws “are unduly restrictive on women” and the constitution should be revisited on this issue. Fine Gael Deputy Jerry Buttimer said that he was born of a crisis pregnancy, but thankfully survived. He said that what they need to do is legislate to end the uncertainty, and to give a sense of confidence to the medical profession and women of Ireland. Labour Deputy Aodhán Ó Riordán said that his party have “stood alone the platform” on the abortion issue, and so have received vulgar letters, abusive phonecalls and had their family members targeted by people who opposed their views. He also accused candidates from other parties of playing dirty tricks and scaremongering on the issue. “We have no difficulty with this when we know that we are right,” he said. TDs who opposed the bill included Independent Deputy Mattie McGrath, who said that he felt that the pro-choice side had used the recent Savita Halappanavar case as leverage for them before the full facts of the case are known. He said he was worried the Government has “bought into this deception”. Also opposing it was Fine Gael Deputy Regina Doherty, who said that she wanted to allow for time and space for the government to come to a consensus on the issue. Deputy Richard Boyd Barrett, by comparison, supported the bill and said that some discussions around the issue of abortion had been “obnoxious and medieval”, particularly around the issue of suicide and pregnancy. Independent Deputy John Halligan spoke of the number of abortion pills that have been seized by customs, and said it is “tragic and appalling that women are reduced to this”. Health Minister Dr James Reilly appealed to the members of the Dáil to participate in the Dáil debates that have been planned over the next couple of weeks following the recent release of the Expert Group report into the A, B, C case. He said that it is his earnest hope that “this time we can reach party consensus” on the issue of legislating for the X Case. Deputy Mick Wallace said that “for too long women who had abortions or advocated for reproductive rights have been stigmatised, shamed and silenced” in Ireland. He supported the bill. 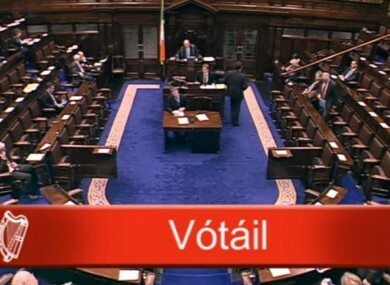 Email “Clare Daly abortion bill defeated by 101 votes to 27”. Feedback on “Clare Daly abortion bill defeated by 101 votes to 27”.